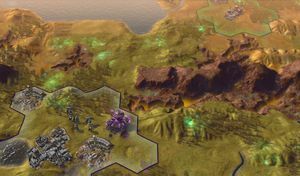 James chats with Civilization: Beyond Earth lead designers Will Miller and David McDonough about the close-to-home Polystralia faction, the Favors system, and why some classic Civ victory conditions have been dropped. Q: Why this game, now? David McDonough: The easy answer is that we love science fiction, and the opportunity to do a Civilization-style game set in the future was a rich and enticing challenge. Of course, this isn’t the first time it's been done. Our fans adored Alpha Centauri – we grew up with that game and we love it a lot too – and they’ve been pleading with Firaxis to make another one for coming on 15 years now. We’ve never been able to do it, but at this particular juncture, the timing and all the various circumstances falling into place, we finally had the opportunity to say, ‘Yes, now’s the time,’ so we took it. Q: Can you speak generally to the role of leaders in Beyond Earth? Will Miller: Leaders have always been an extremely important part of Civilization, going right back to the very first one. In Civilization’s past, they’ve served a historical function obviously. You want to play a game set in history with the cast of characters that were there. They served and important gameplay role as well, by embodying specialisations in many of the gameplay systems, so you have the ‘culture Civ’, or you have the ‘economy Civ’, or the ‘war Civ.’ So they’ll serve that function again, and give a face to your AI opponents. We love that players tell stories about their Civilization games, and they’re always in the context of [their own games]: ‘Gandhi nuked me!’ Their stories are created around these characters. In Beyond Earth we’ve had a little bit of extra footwork, because we don’t have any historical context to draw from when creating these characters, we had to start from scratch. That was a lot of fun for us as designer. Q: You mentioned you’ve had to create entire histories for these new factions in Beyond Earth. What has that process been like, and what sources have you drawn inspiration from? Miller: We’ve drawn inspiration from a lot of different sources. David and I are huge fans of the classic canon of sci-fi, [writers such as] Asimov and Heinlein, Ursula Kroeber Le Guin, Orson Scott Card, Dan Simmons – a lot of sci-fi. We’re also huge fans of the history of space flight, both from the American side and the Russian side. The space race was this fascinating point in our history, and we’re [obviously] huge history buffs! So we not only drew from fiction, but also from history as well, particularly in the early game. Q: Talk us through the creation of the Polystralia faction. McDonough: We had a lot of fun creating this. I think Australian history is fascinating and really rich, but relative to the rest of the world [Australian culture as we understand it today] isn’t that old. It’s new enough that it’s often overlooked as a historical Civ. In this case we had an opportunity to look forward and draw a line from where nations and peoples are today, and then where they might be in a few hundred years following a worldwide cataclysmic event. Polystralia was formed from blending the trajectories of Australia and the Pacific Rim [through to] South-East Asia. We’ve imagined a future in which a global event we call The Great Mistake inspires these two groups to knit their futures together and pool their strengths to create a pan-national entity that would be a superpower and take control of the whole region of the southern Pacific. So Polystralia is a portmanteau of the two regions, of course, but we really see it as a celebration of what makes those two regions really strong. Q: How does Polystralia fit into the new political landscape? What makes them unique? Miller: After The Great Mistake, Polystralia became the food source of the whole world. They figured out very clever methods of agriculture and were able to produce lots and lots of food for people who weren’t able to do it themselves, and in doing so made quite a lot of money. 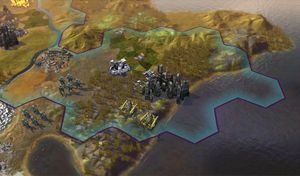 In terms of their gameplay function in Beyond Earth, they are the economy Civ, and they tend to favour policies and gameplay tactics that make them lots of cash. So if you’ve playing against the Polystralia faction, if you’re next to them, it might benefit you to establish trade with them early because they’re going to be making a lot of money. McDonough: Another thing that they really embody is that of all the factions in the game they probably represent the greatest combination of cultures from our current world. So they’re very much building a Civ of international cooperation. As an opponent, they’re more likely to be friendly and more likely to be collaborators in efforts you’re working on, and that sets them apart from some of the more inherently hostile factions like Brasilia and especially ARC, the American Reclamation Corporation. Q: The Polystralia faction is led by Hutama, who is he? McDonough: Yeah, so he’s a figurehead who embodies the Polystralian ideals we just described: wealth, international cooperation, trade, and diplomacy. He’s billed as a young, charismatic mixture of politician and tycoon. He’s a very suave and clever businessman, but also very personable, he has strong populist appeal. He’s the closest of any of the leaders to what you might call a celebrity. He has a television show, and is known as an international figure before he becomes an official of the Polystralian state. As far as the leaders go, he’s also one of the youngest, and probably one of the most interesting to converse with because he has this very extroverted, charismatic way of speaking. Q: We’ve talked about Polystralia’s strengths, what are its weaknesses? Miller: It’s important to us that there aren’t any systematic weaknesses when you’re selecting a Civ. We want it to be a choice between a big list of very good things, so what you don’t take with you is the penalty for what you do. But there are certainly a few ways you could take Hutama down if he were your neighbour: military might, perhaps – if you roll up with some tanks that’ll do the trick. Covert operations are also a good strategy, so if you invest heavily in covert subterfuge, that’s also an avenue that’s pretty effective. But Polystralia can invest in that as well. Q: Hutama is the face of Polystralian diplomacy. How is diplomacy different in Civilization: Beyond Earth? McDonough: Yeah, so functionally, diplomacy is fairly close to what it was in Civilization V. Leaders engage in sporadic discussions, trading items and ideals, commenting on one another’s activities, which can lead to greater friendship or greater hostility, and of course war. There are also a number of new ideas that have been added. As Will mentioned, the covert ops system has been expanded beyond any preceding idea. There’s a lot more ‘under the table’ interaction you can have between civilisations. We have technology you can use to spy on other factions, you can smuggle wealth and goods from their lands, you can sabotage and even plan coup attempts in their cities to take control of them. There are a variety of other activities that factions can do. That’s the black hat flip side to what you do in diplomacy. 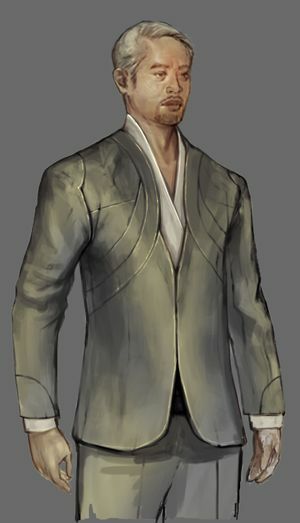 Another big feature we’re excited about is the introduction of a form of diplomatic currency in the game called Favors. This is a new idea for Civ diplomacy, which is you getting the AI to agree to pay you back for something good that you give them. For example, if the AI is low on money, and they ask you to divert some energy their way, they’ll offer you one or more Favors in return. These you can store up and use later on to require, shall we say, that AI to agree to a request that you make. That request can be up to and including declaring war on your behalf. So Favors give you a long term, mastermind-puppeteer perspective on the diplomatic play of the game. You can set up factions to be your allies in a predictable way, you can also set them up to fight each other. You can use it to distract by getting AI leaders to squabble with each other when you need them to be looking the other way as you make a victory attempt, or you can get them to pay you back important resources at a very critical moment when you’re about to make war with somebody else. Miller: We’ve also added a lot of new hooks to diplomacy in the game. One of the biggest new things in the game is called Affinities, these sort of three post-Humanist trajectories that your civilisation progresses through as you play through the game. Depending on which of these Affinities your civilisation devotes itself to, other AIs will react to you differently as they begin devoting themselves to others. So there are a lot more knobs that we’re turning. A lot of the victories that Civilization has previously had…were not as exciting to us. Q: It sounds like victory, or the process of achieving victory has changed in Beyond Earth? Miller: We took a long look at victory in Civilization and decided that a lot of the victories that Civilization has previously had – where you accumulate a value and all of a sudden you win – those were not as exciting to us. Those aren’t in the game. The victories are more involved projects that you have to do, they have a greater expression on the map and are much more transparent to other players. For example, one, which I guess you could call the ‘technology victory’ but it’s really the victory anyone can do regardless of their Affinity, is called the Contact Victory, and it's a homage to the Carl Sagan novel of the same name. Basically, you get a mysterious signal from outer space. You decode it, and it turns out to be plans for a giant machine you have to build. Once you’ve built it, it becomes a massive machine on the map, which takes up an entire hex tile. You have to defend it while it’s being turned on and making contact with this intelligent alien race. That whole process can take 50 or more turns and all the while you have to be very careful about your diplomatic interactions and any wars you have going on, to protect these pieces of infrastructure you have in order to complete it. There are also the three victories for the three different Affinities. There’s the Transcendence Victory, which is a callback to Alpha Centauri, where you discover the planet is sentient, and you build this giant machine to communicate with it. There’s the Promised Land Victory, where you reestablish contact with Earth and build a warpgate to bring settlers through to populate the new world, but you have to protect them while they set up. Then there’s the Emancipation Victory, which is the opposite of that, you establish communication with Earth and build a warpgate, then send soldiers through it to conquer or emancipate Old Earth. So each of the victory conditions is a much more involved process. Civilization: Beyond Earth is due out October 24 on Windows PC, Mac, and Linux.